Conservatives care only about making money and they can not agree with climate change, because than they would have to stop oil drilling and tree logging. I do thank them for destroying the world, so they can stay wealthy. With super storms, forest fires, and floods I think more are coming around to see what's going on. You CAN do good things with money, if you want to. But most of those who belong to Big Money just want to make more bucks, at whatever price. 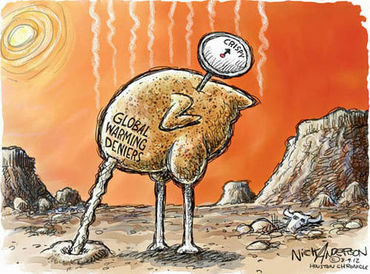 So they don't care about global warming, anyway, global warming doesn't exist.It's one of those inventions of those leftist people like Al Gore (to name just one evil left-winger) who want to destroy the economy. Gee..... wouldn't it be nice if it really were just an invention? Wake up folks, global warming is real and is here. Yes! It's all about short-sighted greed. talk about greed, can I get the proverbial nickel for every time they have lied? Conservatives destroying our Mother Earth. Denial and corporate profits go together like hands and gloves.